Practice has become an increasingly crucial concept in the disciplines that deal with social life. Yet, it is evident that the term practice is typically employed in diverse and ambiguous ways. This is exacerbated by practice frequently being conjoined with a foregoing classifier, for example, legal practice, teaching practice, professional practice and literacy practice. In such cases, semantic attention typically centres on the classifier with the notion of practice being assumed to be unproblematic. 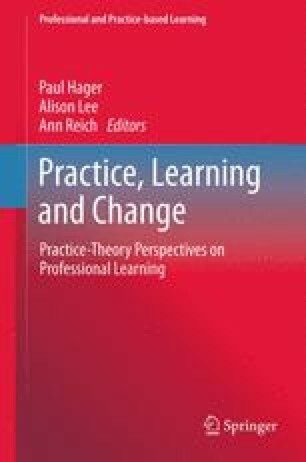 This chapter seeks to problematise and defamiliarise taken-for-granted assumptions about practice and their relationship with learning. Five principles for theorising practice are proposed and discussed. These principles are deployed to suggest fresh understandings of learning and change in relation to practices. In turn, this illuminates issues around how practices are made and how they evolve and change.